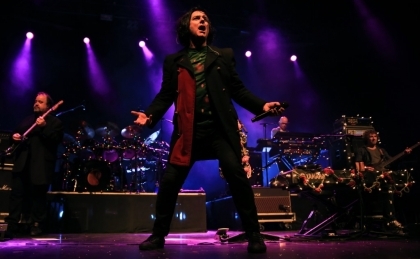 On a cold winter's night in December, Christmas arrived early for those who saw Marillion's sold out Christmas concert at London's Forum. The crowd was warmed with a setlist featuring some classic Marillion songs spanning several decades, including the brilliant 'Sounds That Can't Be Made' from the last album and the evocative Easter. Steve Rothery's guitar solo during the latter song was breathtaking. Many songs were dedicated to others. 'King' was dedicated to Harry Styles. Touchingly, 'No-one can' was played for a lady who had just got engaged. Marillion evidently have a close connection with their fans, one of mutual respect. The Christmas themed set (The Christmas Song (Chestnuts Roasting on an Open Fire), Happy Xmas (War Is Over)) was staged beautifully with colourful lights not only gracing the instruments but also Steve Hogarth's waistcoat, worn with his trademark mischievous grin. Hogarth's energy and presence on stage - running, jumping and hanging from amps - was only rivalled by his stunning vocal performance, especially during Season's End. For the thrilled audience, as indoor snow fell on their smiling faces, the Season had only just begun.